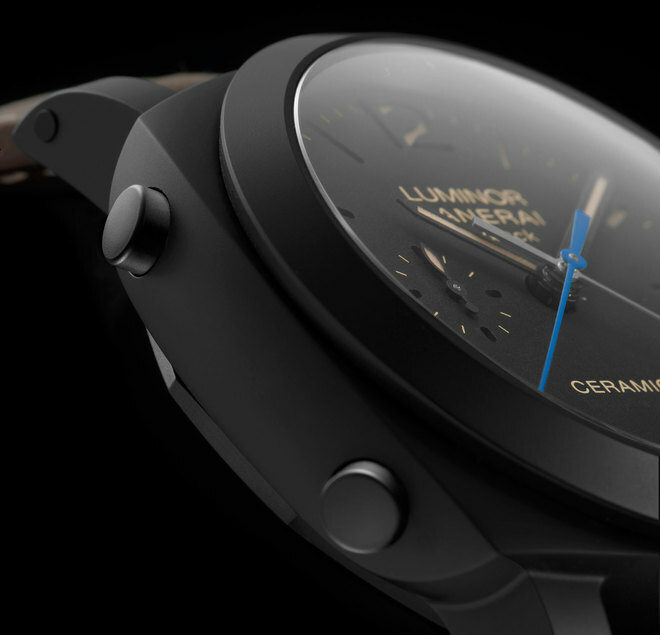 At SIHH last week, Panerai unveiled the Luminor 1950 3 Day Chrono Flyback Ceramica – a real beauty — and here is what you need to know about it: Bead blasted matte dial, black ceramic case, flyback chronograph, stunning blued steel chronograph hand, in-house movement and killer faux patina in a mass appeal 44mm case. 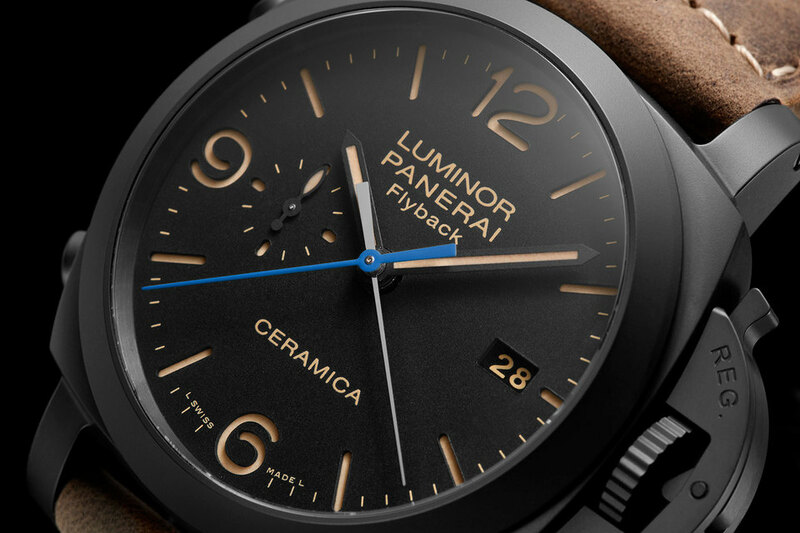 If you are a Panerai lover, you will want to stop reading and get your order in for this one now. Still here? Want more details? Ok. The dial is laid out in a manner anyone familiar with the brand will instantly recognize. The oversized 12, 6 and 9 numerals are prominently featured. At the 3 o’clock position is the date wheel and at the 9 o’clock, the signature small second hand can be found. The indices and numbers feature the simulated patina Panerai has been using in a number if it’s models, and they have absolutely nailed it. The chronograph hand is done in a blued steel, while the minute hand is rhodium plated. Both are central mounted, and the contrast they provide against the matte dial offers a striking visual queue and works like a bright tie on a dark suit. As stated earlier, the Ceramica is a flyback chrono and the pushers to activate the feature are found at 8 o’clock (flyback, reset) and 10 o’clock (start, stop). The ceramic black case is based on zirconium oxide, which is up to five times harder than steel and significantly lighter in weight. To create the compound, a complicated, multi-step process that involves chemical alchemy and the transformation of zirconium powder into black ceramic, must be undertaken. There are successive stages of working and firing of the material, first at low temperatures around 100 C and then at higher temperatures to around 1500 C for three days. Finally the material is bead blasted to give the matte finish. The end result is a dial and case that are resistant to scratches, high temperatures, corrosive agents and the chance encounter with a two year old. The Ceramica is powered by the P.9100 and viewable through the sapphire case back. 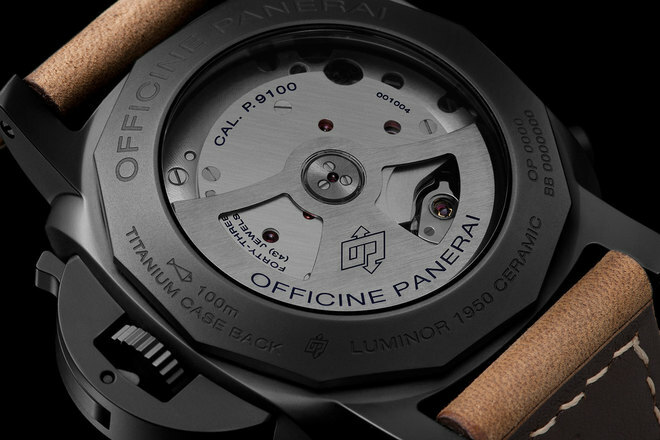 The caliber is Panerai’s first in-house automatic chronograph caliber – complete with a number of features typical of luxury chronographs: a two spring barrel system that allows for a 3 day power reserve; a bidirectional rotator that winds both barrels; and a variable inertia balance wheel that vibrates at 4 Hz. The piece comes with a rubber strap, as well as an interchangeable untreated leather strap that highlights the patina and vintage watch feel of the dial. Those who are part of the vocal Paneristi community will be happy to see that the style is consistent with what they have grown to love – all the way around. This is a must-add for the collection. 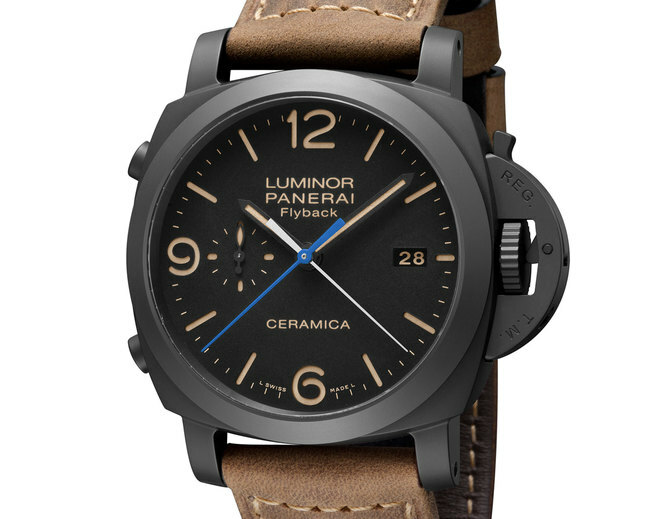 For those who simply love Panerai, it’s still a must-add. The 44mm case is approachable and not overwhelming, while the vintage styling and in-house movement make this a worthy next watch purchase.